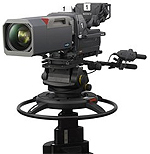 Sony is pleased to introduce the HDC-2000B (Black color body) HD studio hard camera system. The HDC-2000 is a successor model of the HDC-1000 including HDC-1000RLD (3G model). Incredible picture performance and features are realized by incorporating newly developed 16-bit A/D, Digital-Signal-Processing (LSI) and new image-sensors. A remarkable signal-to-noise ratio of 64 dB can be achieved when Noise Suppression (NS) is applied. The current system such as HDC-1000/1500/1400 series camera and HCUs can be used with this new camera system , also existing accessories such as MSU-1000/1500, RCPs, VFs can be used with this new camera system. 3G digital optical transfer HDC-2000 supports standard 3G digital optical transfer via optical fiber cable between the camera and camera control unit. Focus assist functions Various functions are provided for the VF detail signal, which can be added only on images on the viewfinder screen, in order to facilitate focusing, as follows: - Coloring the VF detail signal- Thickening the VF detail signal - Automatically compensating for the VF detail level according to zoom position - Focus assist indicator. The focusing level indicator in the viewfinder provides a guide for focusing. The best focus setting can be easily obtained.